The Papua conflict is an ongoing conflict between the Indonesian government and portions of the indigenous populations of Western New Guinea (Papua) in the Indonesian provinces of Papua and West Papua on the island of New Guinea in which the Indonesian government has been accused[by whom?] of conducting a genocidal campaign against the indigenous inhabitants. Since the withdrawal of the Dutch colonial administration from the Netherlands New Guinea in 1962, the implementation of Indonesian governance in 1963 and the formal absorption of Papua into Indonesia in 1969, the Free Papua Movement (Indonesian: Organisasi Papua Merdeka, (OPM), a militant Papuan-independence organisation, has conducted a low-key guerrilla war against Indonesia through the targeting of its military and police, and engages in the kidnapping of Papuan Indonesian settlers and foreigners. The Papuans have conducted various protests and ceremonies raising their flag for independence or federation with Papua New Guinea, and accuse the Indonesian government of indiscriminate violence and of suppressing their freedom of expression. Over 500,000 Papuans have been killed, and thousands more have been raped, tortured and imprisoned by the Indonesian military since 1969 and the Indonesian governance style has been compared to that of a police state, suppressing freedom of political association and political expression. Indonesia continues to restrict foreign access to the region due to sensitivities regarding its suppression of Papuan nationalism. In December 1949, at the end of the Indonesian National Revolution, the Netherlands agreed to recognise Indonesian sovereignty over the territories of the former Dutch East Indies, with the exception of Western New Guinea, which the Dutch continued to hold as Netherlands New Guinea. The nationalist Indonesian government argued that it was the successor state to the whole of the Dutch East Indies and wanted to end the Dutch colonial presence in the archipelago. The Netherlands argued that the Papuans were ethnically different and that the Netherlands would continue to administer the territory until it was capable of self-determination. From 1950 onwards, the Dutch and the Western powers agreed that the Papuans should be given an independent state, but due to global considerations, mainly the Kennedy administration's concern to keep Indonesia on their side of the Cold War, the United States pressured the Dutch to sacrifice Papua's independence and transfer the territory to Indonesia. In 1962, the Dutch agreed to relinquish the territory to temporary United Nations administration, signing the New York Agreement, which included a provision that a plebiscite would be held before 1969. The Indonesian military organised this vote, called the Act of Free Choice in 1969 to determine the population's views on the territory's future; the result was in favor of integration into Indonesia. In violation of the Agreement between Indonesia and the Netherlands, the vote was a show of hands in the presence of the Indonesian military, and only involved 1025 hand picked people who were forced at gunpoint to vote for integration, much less than 1% of those who should have been eligible to vote. The legitimacy of the vote is hence disputed by independence activists who protest the military occupation of Papua by Indonesia. Indonesia is regularly accused of human rights abuses. They include attacks on OPM-sympathetic civilians and jailing people who raise West Papua's national Morning Star flag for treason. Through the transmigration program, which since 1969 includes migration to Papua, about half of the 2.4 million inhabitants of Indonesian Papua are born in Java. intermarriage is increasing and the offspring of trans-migrants have come to see themselves as "Papuan" over their parents' ethnic group. As of 2010, 13,500 Papuan refugees live in exile in the neighbouring Papua New Guinea (PNG), and occasionally, the fighting spills over the border. As a result, the Papua New Guinea Defence Force has set up patrols along PNG's western border to prevent infiltration by the OPM. Additionally, the PNG government has been expelling resident "border crossers" and making a pledge of no anti-Indonesian activity a condition for migrants' stay in PNG. Since the late 1970s, the OPM have made retaliatory "threats against PNG business projects and politicians for the PNGDF's operations against the OPM". The PNGDF has performed joint border patrols with Indonesia since the 1980s, although the PNGDF's operations against the OPM are "parallel". Prior to the arrival of the Dutch, two Indonesian principalities known as the Sultanate of Tidore and the Sultanate of Ternate claimed dominion over Western New Guinea. In 1660, the Dutch recognized the Sultan of Tidore's sovereignty over New Guinea. It thus became notionally Dutch as the Dutch held power over Tidore. A century later, in 1793, Britain attempted a failed settlement near Manokwari. After almost 30 years, in 1824 Britain and the Netherlands agreed to divide the land; rendering the eastern half of the island as being under British control and the western half would become part of the Dutch East Indies. In 1828, the Dutch established a settlement in Lobo (near Kaimana) which also failed. Almost 30 years later, the Germans established the first missionary settlement on an island near Manokwari. While in 1828 the Dutch claimed the south coast west of the 141st meridian and the north coast west of Humboldt Bay in 1848, Dutch activity in New Guinea was minimal until 1898 when the Dutch established an administrative center, which was subsequently followed by missionaries and traders. Under Dutch rule, commercial links were developed between West New Guinea and Eastern Indonesia. In 1883, New Guinea was divided between the Netherlands, Britain, and Germany; with Australia occupying the German territory in 1914. In 1901, the Netherlands formally purchased West New Guinea from the Sultanate of Tidore, incorporating it into the Dutch East Indies. During World War II, the territory was occupied by Japan but was later recaptured by the Allies, who restored Dutch rule. Four years after the Indonesian National Revolution and Independence on 17 August 1945, the Netherlands formally transferred sovereignty to the United States of Indonesia, the successor state to the Dutch East Indies, on 27 December 1949. However, the Dutch refused to include Netherlands New Guinea in the new Indonesian Republic and decided to assist and prepare it for independence as a separate country. In order to resolve the differences, both countries held the Dutch-Indonesian Round Table Conference in late 1949 but to no avail. It was decided that the present status quo of the territory would be maintained and then negotiated bilaterally one year after the date of the transfer of sovereignty. A year later, both Indonesia and the Netherlands were still unable to resolve their differences, which led Indonesian President Sukarno to accuse the Dutch of reneging on their promises to negotiate the handover of the territory. The Dutch was persistent in their argument that the territory did not belong to Indonesia because the Melanesian Papuans were ethnically and geographically different from Indonesians, and that the territory had always been administrated separately. On top of that, the Papuans did not participate in the Indonesian Revolution, and that the Papuans did not want to be under Indonesian control. While at face-value, the Dutch seems to be having the Papuans’ interest at heart, Arend Lijphart, a Dutch political scientist disagreed. He argued that other underlying Dutch motives to prevent West New Guinea from joining Indonesia included the territory's lucrative economic resources, its strategic importance as a Dutch naval base, and its potential role for housing the Netherlands' surplus population including Eurasians who had become displaced by the Indonesian National Revolution. The Dutch also wanted to maintain a regional presence and to secure their economic interests in Indonesia. On the other hand, Indonesia regarded West New Guinea as an intrinsic part of the country on the basis that Indonesia was the successor state to the Dutch East Indies. These sentiments were reflected in the popular Indonesian revolutionary slogan “Indonesia Merdeka- dari Sabang sampai Merauke” "Indonesia Free—from Sabang to Merauke. The slogan indicates the stretch of Indonesian territory from the most western part in Sumatra, Sabang, and the most eastern part in Merauke, a small city in West New Guinea. Indonesian irredentist sentiments were also inflamed by the fact that several Indonesian political prisoners had been interned at a remote prison camp north of Merauke called Boven-Digoel prior to World War II. Sukarno also contended that the continuing Dutch presence in West New Guinea was an obstacle to the process of nation-building in Indonesia and that it would also encourage secessionist movements. The Netherlands and Indonesia tried to resolve the West New Guinea dispute through several bilateral negotiations between 1950 and 1953. These negotiations ended up to become unsuccessful and led the two governments to harden their stance and position. On 15 February 1952, the Dutch Parliament voted to incorporate New Guinea into the realm of the Netherlands and shortly after, the Netherlands refused further discussion on the question of sovereignty and considered the issue to be closed. In response, President Sukarno adopted a more forceful stance towards the Dutch. Initially, he unsuccessfully tried to force the Indonesian government to abrogate the Round Table agreements and to adopt economic sanctions but was rebuffed by the Natsir Cabinet. Undeterred by this setback, Sukarno made recovering the territory a top priority of his presidency and sought to harness popular support from the Indonesian public for this goal throughout many of his speeches between 1951 and 1952. By 1953, the dispute had become the central issue in Indonesian domestic politics. All political parties across the political spectrum, particularly the Communist Party of Indonesia (PKI), supported Sukarno's efforts to integrate the territory into Indonesia. According to historians Audrey and George McTurnan Kahin, the PKI's pro-integration stance helped the party to rebuild its political base and to further its credentials as a nationalist Communist Party that supported Sukarno. In 1954, Indonesia decided to take the dispute to the United Nations and succeeded in having it placed on the agenda for the upcoming ninth session of the United Nations General Assembly (UNGA). In response, the Dutch Ambassador to the United Nations, Herman van Roijen, warned that the Netherlands would ignore any recommendations which might be made by the UN regarding the dispute. During the Bandung Conference in April 1955, Indonesia succeeded in securing a resolution supporting its claim to West New Guinea from African and Asian countries. In addition, Indonesia was also supported by the Soviet Union and its Warsaw Pact allies. In terms of international support, the Netherlands was supported by the United States, the United Kingdom, Australia, New Zealand, and several Western European and Latin American countries. However, these countries were unwilling to commit to providing military support in the event of a conflict with Indonesia. The Eisenhower administration were open to non-violent territorial changes but rejected the use of any military means to resolve the dispute. Until 1961, the United States pursued a policy of strict neutrality and abstained on every vote on the dispute. According to the historian Nicholas Tarling, the United Kingdom took the position that it was "strategically undesirable" for control of the territory to pass to Indonesia because it created a precedent for encouraging territorial changes based on political prestige and geographical proximity. The Australian Menzies government welcomed the Dutch presence in the region as an "essential link" in its national defense since it also administrated a trust territory in the eastern half of New Guinea. Unlike the Labor Party which had supported the Indonesian nationalists, the Prime Minister Robert Menzies viewed Indonesia as a potential threat to its national security and distrusted the Indonesian leadership for supporting Japan during World War II. In addition, New Zealand and South Africa also opposed Indonesia's claim to the territory. New Zealand accepted the Dutch argument that the Papuans were culturally different from the Indonesians and thus supported maintaining Dutch sovereignty over the territory until the Papuans were ready for self-rule. By contrast, newly independent India, another Commonwealth member supported Indonesia's position. Between 1954 and 1957, Indonesia and their Afro-Asian allies made three attempts to get the United Nations to intervene. All these three resolutions, however, failed to gain a two–thirds majority in the UNGA. On 30 November 1954, the Indian representative Krishna Menon initiated a resolution calling for Indonesia and the Netherlands to resume negotiations and to report to the 10th UNGA Session. This resolution was sponsored by eight countries (Argentina, Costa Rica, Cuba, Ecuador, El Salvador, India, Syria, and Yugoslavia) but failed to secure a two-thirds majority (34-23-3). In response to growing tensions between Jakarta and the Hague, Indonesia unilaterally dissolved the Netherlands-Indonesian Union on 13 February 1956, and also rescinded compensation claims to the Dutch. Undeterred by this setback, Indonesia resubmitted the dispute to the UNGA agenda in November 1965. On 23 February 1957, a 13 country–sponsored resolution (Bolivia, Burma, Ceylon, Costa Rica, Ecuador, India, Iraq, Pakistan, Saudi Arabia, Sudan, Syria, and Yugoslavia) calling for the United Nations to appoint a "good offices commission" for West New Guinea was submitted to the UNGA. Despite receiving a plural majority (40-25-13), this second resolution failed to gain a two-thirds majority. Undeterred, the Afro-Asian caucus in the United Nations lobbied for the dispute to be included on the UNGA agenda. On 4 October 1957, Indonesia's Foreign Minister Subandrio warned that Indonesia would embark on "another cause" if the United Nations failed to bring about a solution to the dispute that favoured Indonesia. That month, the PKI and affiliated trade unions lobbied for retaliatory economic measures against the Dutch. On 26 November 1957, a third Indonesian resolution on the West New Guinea dispute was put to the vote but failed to gain a two-thirds majority (41-29-11). Following the recent defeat at the UN, Indonesia embarked on a national campaign targeting Dutch interests in Indonesia; leading to the withdrawal of the Dutch flag carrier KLM's landing rights, mass demonstrations, and the seizure of the Dutch shipping line Koninklijke Paketvaart-Maatschappij (KPM), Dutch-owned banks, and other estates. By January 1958, 10,000 Dutch nationals had left Indonesia, many returning to the Netherlands. This spontaneous nationalisation had adverse repercussions on Indonesia's economy, disrupting communications and affecting the production of exports. President Sukarno also abandoned efforts to raise the dispute at the 1958 UNGA, claiming that reason and persuasion had failed. Following a sustained period of harassment against Dutch diplomatic representatives in Jakarta, Indonesia formally severed relations with the Netherlands in August 1960. In response to Indonesian aggression, the Netherlands stepped up its efforts to prepare the Papuans for self-determination in 1959. These efforts culminated in the establishment of a hospital in Hollandia (modern–day Jayapura), a shipyard in Manokwari, agricultural research sites, plantations, and a military force known as the Papuan Volunteer Corps. By 1960, a legislative New Guinea Council had been established with a mixture of legislative, advisory and policy functions had been established. Half of its members were to be elected and elections for this council were held the following year. Most importantly, the Dutch also sought to create a sense of West Papuan national identity and these efforts led to the creation of a national flag (the Morning Star flag), a national anthem, and a coat of arms. The Dutch had planned to transfer independence to West New Guinea in 1970. By 1960, other countries in the Asia-Pacific had taken notice of the dispute and began proposing initiatives to end it. During a visit to the Netherlands, the New Zealand Prime Minister Walter Nash suggested the idea of a united New Guinea state, consisting of both Dutch and Australian territories. This idea received little support from both Indonesia and other Western governments. Later that year, the Malayan Prime Minister Tunku Abdul Rahman proposed a three-step initiative, which involved West New Guinea coming under United Nations trusteeship. The joint administrators would be three non-aligned nations Ceylon, India, and Malaya, which supported Indonesia's position. This solution involved the two belligerents, Indonesia and the Netherlands, re-establishing bilateral relations and the return of Dutch assets and investments to their owners. However, this initiative was scuttled in April 1961 due to opposition from Indonesia's Foreign Minister Subandrio, who publicly attacked Tunku's proposal. By 1961, the Netherlands was struggling to find adequate international support for its policy to prepare West New Guinea for independent status under Dutch guidance. While the Netherlands' traditional Western allies—the United States, Great Britain, Australia, and New Zealand—were sympathetic to Dutch policy, they were unwilling to provide any military support in the event of conflict with Indonesia. On 26 September 1961, the Dutch Foreign Minister Joseph Luns offered to hand over the territory to a United Nations trusteeship. This proposal was firmly rejected by his Indonesian counterpart Subandrio, who likened the dispute to Katanga's attempted secession from the Republic of Congo during the Congo Crisis. By October 1961, Britain was open to transferring West New Guinea to Indonesia while the United States floated the idea of a jointly-administered trusteeship over the territory. On 23 November 1961, the Indian delegation at the United Nations presented a draft resolution calling for the resumption of Dutch–Indonesian talks on terms which favoured Indonesia. Two days later, several Francophone countries in Africa tabled a rival resolution which favoured an independent West New Guinea. Indonesia favoured India's resolution while the Dutch, Britain, Australia, and New Zealand supported the Francophone African one. On 27 November 1961, both the Francophone African (52-41-9) and Indian (41-40-21) resolutions were put to the vote failed to gain a two–thirds majority at the UNGA. The failure of this final round of diplomacy in the UN convinced Indonesia to prepare for a military invasion. By 1961, the United States had become concerned about the Indonesian military's purchase of Soviet weapons and equipment for a planned invasion of West New Guinea. The Kennedy administration feared an Indonesian drift towards Communism and wanted to court Sukarno away from the Soviet bloc and Communist China. The United States also wanted to repair relations with Jakarta, which had deteriorated due to the Eisenhower administration's covert support for regional uprisings in Sumatra and Sulawesi. These factors convinced the Kennedy administration to intervene diplomatically to bring about a peaceful solution to the dispute, which favored Indonesia. Throughout 1962, US diplomat Ellsworth Bunker facilitated top–secret high–level negotiations between Indonesia and the Netherlands. This produced a peace settlement known as the New York Agreement on 15 August 1962. As a face-saving measure, the Dutch would hand over West New Guinea to a provisional United Nations Temporary Executive Authority (UNTEA) on 1 October 1962, which then ceded the territory to Indonesia on 1 May 1963; formally ending the dispute. As part of the agreement, it was stipulated that a popular plebiscite would be held in 1969 to determine whether the Papuans would choose to remain in Indonesia or seek self-determination. Implementation of Indonesian governance was followed by sporadic fighting between Indonesian and pro-Papuan forces until 1969. Following the referendum in 1969, the territory was formally integrated into Indonesia. Instead of 816,000 Papuans, only 1,022 Papuan tribal representatives were allowed to vote and all of these were coerced into voting in favour of integration. While several international observers including journalists and diplomats criticised the referendum as being rigged, the United States and Australia support Indonesia's efforts to secure acceptance in the United Nations for the pro-integration vote. That same year, 84-member states voted in favour for the UN to accept the result, with 30 others abstaining. Due to Dutch efforts to promote a national identity, a significant number of Papuans refused to accept the territory's integration into Indonesia. These formed the separatist Free Papua Movement (OPM) and have waged an insurgency against Indonesia, which still continues to this day. July–August 1969: Act of Free Choice / PEPERA determines Western New Guinea as sovereign territory of Indonesia. June 1971: Henk de Mari reported that 55 men from two villages in North Biak were forced to dig their own graves before being shot. Published in Dutch daily De Telegraaf Oct 1974. Unknown: 500 Papuan corpses were found in jungle Lereh District, south west of Sentani Airport, Jayapura region. 1974: In North Biak, 45 Papuans were killed. 1975: In Biak, at least 41 people from Arwam and Rumbin villages were killed. 1977: Aerial bombing of Akimuga (McMoRan Exploration Co. mine area). 1977–78: Aerial bombing of Baliem Valley. Apr 1978: Six unidentifiable bodies were discovered in the Dosai district of Jayapura. May 1978: Five OPM leaders surrendered to save the village they were caught in. They were beaten to death with red hot iron bars and their bodies thrown into a pit latrine. The 125 villagers were then machine gunned as suspected OPM sympathisers. June 1978: 14 corpses found shot, West of Sentani Airport, Jayapura region. Unknown: North Biak, 12 people were shot after receiving permission to leave camp to collect sago for a village feast. 1981: 10 Papuans were killed, and 58 disappeared without trace. Paniai Region. Jun–Aug 1981: Operasi Sapu Bersih (Operation Clean Sweep); population of Ampas-Waris and Batte-Arso villages were bayoneted and left for dead. Sep–Dec 1981: An estimated 13,000 Papuans were killed in the central highlands. July 1984: Naval, air, and ground troop assault of Nagasawa/Ormo Kecil village; 200 were killed. Unknown: Naval shelling of Taronta, Takar, and Masi-Masi coastal villages; the survivors fled towards Jayapura; under Dutch rule in 1950 each village had a population of 1500 to 2000. 24 June 1985: 2,500 were killed in Paniai area of Wissel Lake district, including 115 from Iwandoga and Kugapa villages. 1986–87: 34 were killed in Paniai/Wissel Lake District. 8 January 1996: OPM militants led by Kelly Kwalik held 26 members of the Lorentz Expedition hostage in Mapenduma [id]. This triggered the Mapenduma hostage crisis (two hostages died) and the 1996 Timika shooting incident on 15 April (sixteen died). 9 May 1996: Mapenduma hostage crisis ends with the raid on OPM base in Geselama, Mimika, by Kopassus. 6 October 2000: As police raided a flag-raising ceremony in Wamena, two non-Papuans were killed in unclear circumstances. A riot began and moved to a neighbourhood of migrants from outside of Papua, burning and looting shops. Seven Papuans were shot and twenty-four non-Papuans killed. 11 November 2001: Two weeks after rejecting the autonomy law as soon as it had passed, the chairman of the Papua Presidium Council, Theys Eluay, was found murdered in his car outside Jayapura after he had been kidnapped. 31 August 2002: Gunmen attacked a group of American school teachers and local employees on a sightseeing trip. Two Americans and one Indonesian were killed, and seven Americans and an Indonesian girl were wounded. Indonesian officials placed responsibility on the OPM; a spokesman for the group denied involvement. 1 December 2003: A group of 500 people hoisted the separatist flag, several other actions took place, 42 people were arrested. 15 October 2004: Papuan rebels killed six civilians in an attack in Puncak Jaya. 16 March 2006: Three policemen and an airman were killed and 24 other people injured during a clash with Papuan students who had been demanding closure of Freeport's Grasberg mine in Papua. 9 August 2008: In Wamena, one man, Opinus Tabuni (a distant relative of Buchtar Tabuni), was killed when Indonesian security forces opened fire in response to the raising of the banned Morning Star flag by activists at a large rally organised by DAP (Dewan Adat Papua – Papuan Customary Council) marking the UN-declared International Day of the World's Indigenous People. 4 December 2008: Four Papuans were wounded by gunfire from the police at a demonstration for the independence of West Papua. 29 January 2009: At least five Papuans were wounded by shots fired by police during a demonstration. 14 March 2009: One Indonesian Army soldier was killed during an attack against a security post in Tingginambut. The OPM was blamed. 8 April 2009: Several bombs exploded against a bridge and a refinery on the island of Biak. One person was killed. 9 April 2009: A bomb attack in Jayapura killed five and severely injured several others. Meanwhile, about 500 militants attacked a police post with bows and arrows and petrol bombs. One died after being shot by police. 11–12 April 2009: Fighting between the army and the Papuan resistance left eleven dead, including six members of the security forces. At the same time, a bomb was defused beside a police station in Biak. 15 April 2009: An attack against a convoy of police in Tingginambut killed one and wounded six. The OPM was blamed. 11 July 2009: An employee of Freeport-McMoRan Copper & Gold Inc.’s Indonesian unit was shot dead in an attack outside the company’s mine in Papua. July 2009: OPM members hoisted the flag of West Papua in the village of Jugum. Afterwards more than thirty houses were burned by the Indonesian army. 12 August 2009: A convoy of sixteen buses for employees of Freeport-McMoRan Copper's was ambushed. Two people were killed and five wounded. 16 December 2009: Free Papua Movement (OPM) leader Kelly Kwalik was shot by Indonesian police during a raid in Timika and died in Timika Hospital. 24 January 2010: Rebels ambushed a convoy of mining company PT Freeport McMoRan employees. Nine people were injured; OPM denied responsibility. 1 March 2010: The Australian West Papua Association in Sydney said that the situation in West Papua was deteriorating. Since the previous July there had been fourteen incidents of shootings around the Grasberg mine, Freeport's copper and gold mine. The attacks had killed at least three and injured thirteen. 23 March 2010: Rebels attacked an Indonesian military convoy, injuring some of the soldiers. May 2010 : The OPM were suspected of killing three workers at a construction site. In retaliation the Indonesian military raided a village leaving at least two dead and a woman raped, while houses in three villages were burned by the military. 17 May 2010: The army attacked a base of OPM killing one suspected militant. 21 May 2010: Militants attacked members of the Indonesian army near Yambi, 75 km from Mulia. No casualties were reported. 15 June 2010: An officer of the Indonesian elite police was shot dead during a patrol, Eight firearms were also stolen by the rebels. July 2010: Twelve houses and two churches were destroyed and a woman was raped during an Indonesian army operation to capture Goliath Tabuni. 23 June 2011: A police officer from Jayapura was shot by alleged members of the Free Papua Movement. 6 July 2011: Three soldiers were shot during a clash with unknown attackers in Kalome village, Tingginambut district. 20 July 2011: An Indonesian soldier was killed in an ambush against a military security squad in Puncak Jaya district in Papua. 31 July 2011: Rebels attacked a car in Papua with guns, axes and knives killing one soldier and three civilians and also wounding seven; OPM denied responsibility. 1 August 2011: The National Police said that members of the Free Papua Movement killed four civilians near Tanjakan Gunung Merah, Paniai. 2 August 2011: A soldier guarding a military post in Tingginambut was shot dead. In the town of Mulia two shootings targeted the police and military, injuring one soldier. 3 August 2011: Separatists shot at an army helicopter as it evacuated the body of a soldier they had allegedly killed. 22 October 2011: Al Jazeera published footage of an independence gathering that was attacked by Indonesian security forces. At least five people were killed. 2 December 2011: An officer from Jayapura Police office was found dead next to a river after he was allegedly slain by a group wielding arrows and daggers. OPM was blamed. 5 December 2011: Two policemen were killed in Puncak Jaya during an exchange of gunfire with suspected members of the Free Papua Movement. 12 December 2011: Police attacked the headquarters of a local cell of the OPM. The police seized firearms, ammunition, knives, combat gear, documents, and Morning Star flags, and killed 14 militants. In 2012, West Papuan National Committee's (KNPB) Chairman Mako Tabuni died in hospital after sustaining a shooting injury during an arrest attempt by the Jayapura police department. 22 February 2013: A military helicopter was damaged by ground fire while attempting to remove the bodies of soldiers killed fighting the OPM earlier. At least three members of the crew were injured. Eight Indonesian soldiers were killed in fighting around the same time. 7 April 2014: A border post between Papua New Guinea and Indonesia was damaged and the border crossing temporally closed after a shoot out between the Indonesian Military and "armed civilians". Papua New Guinea local media reported that OPM fighters may have fired from the New Guinea side of the border and were dressed in blue berets to resemble United Nations personnel. No casualties were reported. 18 September 2014: In a fire fight between Indonesian Security forces and around thirty OPM members at an airfield in the Lanny jaya district, an OPM member was killed and several people wounded. The group of OPM fighters were suspected to be responsible for shooting dead two policemen in July. 13 October 2014: An individual carrying equipment and a large amount of ammunition was apprehended at Sentani airport. The illegal items were found during a routine X-ray after which the suspect attempted escape but was apprehended 200m from the airport. Items seized included 112 5.56-calibre bullets, 20 .56-calibre bullet casings, 13 9-calibre bullets and a single 7.6-calibre cartridge. The police also seized one weapon and a Nokia mobile phone. Earlier, the Papua Police managed to confiscate dozens of home-made weapons and rounds of ammunition during a raid on the OPM’s local headquarters. A policeman involved said; "As many as 20 rounds of Mauser ammunition, five home-made weapons, one motorcycle and striped uniforms were confiscated during the raid,". 8 December 2014: Four youths were killed and 10 to 21 others were injured during an incident in the Paniai district. Government officials said a few hundred protesters attacked local military and police posts, while rights activists accused the military of shooting at unarmed people after several smaller incidents earlier in the day. 24 March 2015: General Goliath Tabuni and 23 of his followers surrendered to the Indonesian army in Tingginambut, Puncak Jaya. 9 September 2015: Four woodcutters were attacked by armed militants near the border with Papua New Guinea. One of them was killed. Another one was injured while the remaining two were taken hostage and brought to Papua New Guinea. OPM claimed the attack, and stated that they demand prisoner exchange with their two comrades who were arrested. The Indonesian government appealed for help to the Papua New Guinean government. The two hostages was released in 18 September 2015, after the militants were arrested by the Papua New Guinea Defence Force. 26 January 2016: Ten militants surrendered to the Indonesian Army in Puncak Jaya. They used to be the followers of General Goliath Tabuni, who surrendered in 2015. The government is planning to give them amnesty. May 2016: Mass demonstrations in support of the United Liberation Movement for West Papua and its efforts to join the Melanesian Spearhead Group began in early May and continued throughout the month. Indonesian police responded by arresting thousands of demonstrators. 24 March 2017: 154 guerrilla fighters in Papua province have surrendered to the Indonesian government in a ceremony in Puncak district, the Indonesian army said in a statement. 28 March 2017: A Suspect West Papuan man who was described by authorities as an armed separatist leader, was shot dead by the Indonesian police. 22 October 2017: A National Police Mobile Brigade officer was shot and killed in Mimika near the Freeport Grasberg mine with an TPNPB unit taking responsibility who were being pursued after they shot at Freeport mine vehicles on 24 September. Police suspected that the TPNPB used Steyr assault rifles. On 21 October, the TPNPB had declared an area near the mine as a battlefield including the villages of Banti and Kimbeli. 9 November 2017: The military claimed that migrant workers from Indonesia’s Sulawesi island in Banti and Kimbeli villages were being held hostage by the TPNPB which was disputed by an Indonesian government minister who said they had been "isolated" by the fighting. The TPNPB denied there were non-native hostages. The TPNPB earlier stated if the military or police take reprisals against innocent Papuans then reciprocal will be done to immigrants residing in PT Freeport area. 15 November 2017: A National Police Mobile Brigade officer was shot and killed in Mimika with an TPNPB unit taking responsibility. Two TPNPB were injured in gunfire on 17 November. Freeport temporarily shut the main supply route to its Grasberg mine complex. A civilian employee of a catering service provider within Freeport died in suspicious circumstances whilst travelling to his village. 17 November 2017: Indonesian police and military evacuated more than 340 Sulawesi migrants from the villages of Banti and Kimbeli. The police stated there was an exchange of gunfire with the TPNPB. Freeport began evacuating mine workers families from the mining town of Tembagapura. Shots had been fired on a Freeport vehicle and two large mining trucks set on fire. 2 December 2018: At least 19 workers constructing a bridge at Trans Papua projects were killed by an armed group linked to the West Papua Liberation Organization. One Indonesian soldier is also killed on a separate incident. This event is also known as Nduga massacre. 28 January 2019: A Kostrad soldier guarding an airport in Nduga was killed and another was injured following a firefight. 7 March 2019: 25 TNI soldiers guarding construction of the Trans-Papua road engaged in a firefight with West Papua National Liberation Army personnel. TNI spokesmen claimed that 3 soldiers were killed while 7 Liberation Army personnel were killed. Vanuatu — Vanuatu passed the Wantok Blong Yumi Bill (Our Close Friends) in 2010 and expressed their support for Papuan self-determination in 2017 at the UNGA. Solomon Islands — The Solomon Islands expressed their support for Papuan self-determination in 2017 at the UNGA. ^ Taylor, Rob (27 March 2007). "Australia risks Papua conflict role -- activists". Reuters. Thomson Reuters. Retrieved 17 January 2019. ^ Rollo, Stuart (28 October 2013). "Ending our pragmatic complicity in West Papua". ABC News. Australian Broadcasting Corporation. Retrieved 17 January 2019. ^ Pearson, Elaine (5 November 2016). "Australia should go to Papua and see the human rights situation for itself". The Guardian. Guardian Media Group. Retrieved 17 January 2019. ^ The current status of the Papuan pro-independence movement (PDF) (Report). IPAC Report. Jakarta: Institute for Policy Analysis of Conflict. 24 August 2015. OCLC 974913162. Retrieved 24 October 2017. ^ "38 Year TPN-OPM No Unity and Struggle After the Reformation" (PDF). National Liberation Army of West Papua (TPNPB). 9 June 2016. Retrieved 24 October 2017. ^ a b c Maran, Major Arm Fence D (2008). Anatomy of Separatists (PDF) (Report). Indonesian intelligence. ^ George, William Lloyd (17 July 2011). "No Man's Island". Newsweek. Retrieved 17 July 2011. ^ a b c Celerier, Philippe Pataud (June 2010). "Autonomy isn't independence; Indonesian democracy stops in Papua". Le Monde Diplomatique. ^ "Papua als Teil Indonesiens". Indonesia-portal. Archived from the original on 19 July 2011. Retrieved 15 April 2011. ^ a b c Pike, John (17 April 2009). "Free Papua Movement". Federation of American Scientists. Retrieved 20 April 2011. ^ Protest and punishment : political prisoners in Papua : Indonesia (PDF). Short Reports, Asia. 10, no. 4(C). New York: Human Rights Watch. 2007. OCLC 488476678. Retrieved 3 October 2017. ^ Singh, Bilveer (2008). Papua: Geopolitics and the Quest for Nationhood. Transaction Publishers. pp. 61–64. ^ Penders, Christian Lambert Maria (2002). The West New Guinea Debacle: Dutch Decolonization and Indonesia, 1945–1962. Honolulu: University of Hawaii Press. p. 154. ISBN 0824824709. ^ Crocombe, Ron` (2007). Asia in the Pacific Islands: Replacing the West. Institute of Pacific Studies, Suva, Fiji: IPS Publications, University of the South Pacific. pp. 285, 284, 286–291. ISBN 9789820203884. Retrieved 17 April 2018. ^ Lintner, Bertil (21 January 2009). "Papuans Try to Keep Cause Alive". Jakarta Globe. Retrieved 9 February 2009. ^ Heidbüchel, Esther (2007). The West Papua Conflict in Indonesia: Actors, Issues, and Approaches. Wettenberg: J & J Verlag. pp. 87–89. ISBN 9783937983103. ^ May, Ronald James (2001). State and Society in Papua New Guinea: The First Twenty-Five Years. ANU E Press. pp. 238, 269, 294. ^ King, Peter (2004). West Papua & Indonesia since Suharto: Independence, Autonomy, or Chaos?. UNSW Press. p. 179. ^ Miller, George (2012). Indonesia Timur Tempo Doeloe 1544–1992. Depok: Komunitas Bambu. p. 24. ^ Crocombe, Ron (2007). 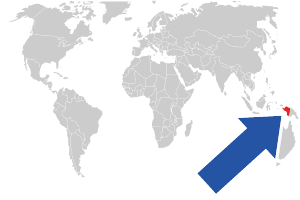 Asia in the Pacific Islands. IPS Publication, University of South Pacific. p. 286-91. ^ Gordon, Rotman. L (2002). World War II Pacific Island Guide: A Geo Military Study. Greenwood Publishing Group. ^ Kahin, Audrey (1995). WSubversion as Foreign Policy: The Secret Eisenhower and Dulles Debacle. New York: The New Press. p. 34. ^ a b Djiwandono, Soedjati, Konfrontasi Revisited, p. 38 . ^ Tarling, Nicholas (2004). Britain and the West New Guinea Dispute. UNSW Press. p. 19. ^ Legge, John D. (2003). Sukarno: A Political Biography. Singapore: Archipelago Press. p. 403-4. ^ a b Crocombe, Ron, Asia in the Pacific Islands, pp. 286–91 . ^ Human Rights Watch (July 2001). Indonesia : violence and political impasse in Papua (PDF). New York: Human Rights Watch. OCLC 67134257. Vol. 13,No. 2(C). Retrieved 3 October 2017. ^ "Indonesia". State.gov. 4 March 2002. Retrieved 4 December 2013. ^ "Free Papua Movement". Historycommons.org. Retrieved 15 April 2011. ^ Ilya, Gridneff (26 February 2014). "Calls to probe Aussie death in Papua". Fairfax. Sydney Morning Herald. Retrieved 17 January 2016. ^ "'Papua separatists' kill six civilians, JAKARTA POST". Worldsources Online. 15 October 2004. ^ "LEAD: 4 security personnel killed in clash over U.S. mine. | Goliath Business News". Goliath.ecnext.com. 20 March 2006. Retrieved 15 April 2011. ^ "INDONESIA: The killing of a Papuan at a demonstration remains unpunished — Asian Human Rights Commission". Ahrchk.net. Retrieved 15 April 2011. ^ a b c d e "West Papua Report – May 2009". Friends of Peoples close to Nature. Archived from the original on 15 May 2009. ^ "Separatists attack Indonesia's Papua, killing one soldier_English_Xinhua". News.xinhuanet.com. 14 March 2009. Archived from the original on 9 June 2011. Retrieved 15 April 2011. ^ "Police blame group for election attacks « Free West Papua – For a Free and Independent West Papua". Westpapuareview.wordpress.com. 25 April 2009. Retrieved 15 April 2011. ^ "Violence in West Papua « Free West Papua – For a Free and Independent West Papua". Westpapuareview.wordpress.com. 11 April 2009. Retrieved 15 April 2011. ^ Moestafa, Berni (11 July 2009). "Freeport Indonesia Employee Shot Dead in Attack Near Papua Mine". Bloomberg. Retrieved 15 April 2011. ^ "INDONESIA: Police and soldiers burn houses and destroy resources in Papua's Bolakme district — Asian Human Rights Commission". Ahrchk.net. Retrieved 15 April 2011. ^ SD. "Pour convaincre, la vérité ne peut suffire: Une insurrection oubliée en Papouasie indonésienne". Pourconvaincre.blogspot.com. Retrieved 15 April 2011. ^ "Fears for more tension in Mimika after killing of Papua's Kwalik". Solomonstarnews.com. 22 January 2010. Archived from the original on 14 June 2011. Retrieved 15 April 2011. ^ "OPM Denies Responsibility for Ambush And Calls Police Accusation 'Baseless'". The Jakarta Globe. Archived from the original on 26 April 2012. Retrieved 15 April 2011. ^ "AWPA Calls Rudd To Raise West Papua With Indonesia". Pacific.scoop.co.nz. Retrieved 15 April 2011. ^ "West Papua Report April 2010: OPM ceasefire call, Troop increase, Merauke food estate, State Dept.HR". Freewestpapua.org. Retrieved 15 April 2011. ^ a b c "West Papua Report June 2010". Etan.org. Retrieved 15 April 2011. ^ "Brimob Officer on Trail Of OPM Gunned Down". The Jakarta Globe. Archived from the original on 24 February 2012. Retrieved 15 April 2011. ^ "West Papua Report July 2010". Etan.org. 1 December 1961. Retrieved 15 April 2011. ^ "Assailant Shoots Police Officer in Jayapura". The Jakarta Globe. 24 June 2011. Archived from the original on 3 November 2014. Retrieved 4 December 2013. ^ a b "Soldier Killed in Another Ambush in Papua". The Jakarta Globe. 21 July 2011. Archived from the original on 3 November 2014. Retrieved 4 December 2013. ^ "Un soldat et trois civils tués dans une attaque en Indonésie – Actualité Asie". Chine-informations.com. Retrieved 4 December 2013. ^ "(Australian Broadcasting Corporation)". Australia Network News. Archived from the original on 14 March 2012. Retrieved 4 December 2013. ^ "OPM launched double attacks against civilians: Police". The Jakarta Post. 1 August 2011. Archived from the original on 3 November 2014. Retrieved 4 December 2013. ^ a b "Separatists Kill Soldier, Attack Chopper in Papua: Police". The Jakarta Globe. 3 August 2011. Archived from the original on 3 November 2014. Retrieved 4 December 2013. ^ "Forces raid Papuan independence gathering". Al Jazeera. 22 October 2011. Retrieved 22 October 2011. ^ "West Papua Report November 2011". Etan.org. Retrieved 4 December 2013. ^ "Police officer killed in Papua". News.asiaone.com. 2 December 2011. Archived from the original on 11 November 2014. Retrieved 4 December 2013. ^ "Two policemen die in Papua shootout". UPI.com. Retrieved 4 December 2013. ^ "Soldiers Kill Suspected OPM Member in Gunfight". The Jakarta Globe. 6 January 2012. Archived from the original on 3 November 2014. Retrieved 4 December 2013. ^ "Kompas – Penembakan Mako Tabuni Hingga Tewas Dipertanyakan'". kompas.com. 15 June 2012. Retrieved 19 March 2014. ^ "BBC News – Indonesian army helicopter 'shot at in Papua'". Bbc.co.uk. 22 February 2013. Retrieved 4 December 2013. ^ "Indonesia, PNG Border Shootout Closes Border Post". Pacific Islands Report. 7 April 2014. Archived from the original on 12 October 2014. ^ "OPM member killed in shoot out". Radio New Zealand. 18 September 2014. Retrieved 3 October 2017. ^ Dharma Somba, Nethy (13 October 2014). "Hundreds of rounds of ammunition confiscated at Sentani Airport". The Jakarta Post. Retrieved 3 October 2017. ^ "Fresh unrest rocks Indonesia's Papua province". Retrieved 10 May 2016. ^ PT. VIVA MEDIA BARU – VIVA.co.id. "Pangdam Cenderawasih Goliat Tabuni Belum Menyerah". Retrieved 10 May 2016. ^ Suriyanto. "Juru Bicara OPM: Penyanderaan WNI Dipimpin Lucas Bomay". CNN Indonesia. Retrieved 10 May 2016. ^ Rinaldy Sofwan Fakhrana. "OPM Sandera Dua Warga Indonesia di Papua Nugini". CNN Indonesia. Retrieved 10 May 2016. ^ Muhaimin (18 September 2015). "Cerita Jenderal PNG soal Penyelamatan 2 WNI dari OPM". SINDOnews.com. Retrieved 10 May 2016. ^ "10 Anggota OPM Menyerah: Kami Bosan Berjuang, Tidak Ada Hasil". Klikkabar.com. Retrieved 10 May 2016. ^ "More mass demos in West Papua". Radio New Zealand. 31 May 2016. Retrieved 31 May 2016. ^ "Over 150 rebels surrender to Indonesian government in Papua". ^ "West Papuan 'separatist' killed in police shootout". Radio NZ. 30 March 2017. ^ a b Dharma Somba, Nethy (23 October 2017). "Brimob officer dies in exchange of fire with armed group in Papua". Jakarta Post. Retrieved 18 November 2017. ^ a b c Jensen, Fergus; Wanda, Sam (18 November 2017). "Indonesia evacuates villagers after shootings near Freeport copper mine". Reuters. Retrieved 18 November 2017. ^ a b Andespu, Putra; Mambor, Victor (10 November 2017). "Indonesia Orders 'Persuasive Action' Against Papuan Separatists". BenarNews. Retrieved 20 November 2017. ^ a b Ambarita, Banjir (29 October 2017). "TPN OPM klaim bertanggung jawab terhadap serangan teror di area Freeport". Rappler (in Indonesian). Retrieved 20 November 2017. ^ a b "Papua separatists dispute Indonesia's claim of holding villagers hostage". ABC News. Australian Broadcasting Corporation. 11 November 2017. Retrieved 18 November 2017. ^ a b "Papuan hostage claims a distortion says Indonesian lawyer". Radio New Zealand. 13 November 2017. Retrieved 18 November 2017. ^ "DPRD Mimika Elminus Mom, Lift Votes Related Statement of TPN-OPM Attitudes Circulating at Medsos". Freewest Papua. 28 October 2017. Retrieved 20 November 2017. ^ Nathalia, Telly (15 November 2017). "Gunmen Kill Elite Police Officer in Papua". Jakarta Globe. Retrieved 18 November 2017. ^ Topsfield, Jewel; Rosa, Amilia (19 November 2017). "High noon in Papua: conflict simmers around Freeport mine". Sydney Morning Herald. Retrieved 18 November 2017. ^ a b Wanda, Sam; Jensen, Fergus (17 November 2017). "Indonesia evacuates villagers after shootings near Freeport copper mine". Reuters. Retrieved 20 November 2017. ^ Dharma Somba, Nethy (17 November 2017). "Hundreds of residents escorted out of besieged Papuan villages". The Jakarta Post. Retrieved 20 November 2017. ^ a b Wanda, Sam (17 November 2017). "Freeport evacuating Indonesian mine worker families after shootings". Reuters. Retrieved 20 November 2017. ^ "Hostilities continue in Nduga, Papua". Radio New Zealand. 13 July 2018. Retrieved 11 December 2018. ^ "Traumatised Papuans flee conflict in Nduga". Radio New Zealand. 16 July 2018. Retrieved 11 December 2018. ^ "West Papua Liberation Army claims responsibility for Papua killings". Radio NZ. ^ "Gunmen kill workers in Indonesia's Papua". BBC News. 4 December 2018. Retrieved 13 December 2018. ^ "Rombongan Bupati Nduga Diserang Anggota KKB, 1 Prajurit TNI Gugur". KOMPAS (in Indonesian). Retrieved 7 February 2019. ^ "TNI soldiers killed in clash with West Papua liberation army". The Jakarta Post. 8 March 2019. Retrieved 8 March 2019. ^ Manning, Selwyn (22 June 2010). "Vanuatu to seek observer status for West Papua at MSG and PIF leaders summits". Pacific Scoop. Retrieved 20 October 2017. ^ a b "Fiery debate over West Papua at UN General Assembly". Radio New Zealand 2017. 27 September 2017. Retrieved 7 October 2017. ^ Davidson, Helen (6 May 2016). "Jeremy Corbyn on West Papua: UK Labour leader calls for independence vote". The Guardian. ^ "Greens Leader Richard Di Natale Calls For BP Rethink On West Papuan Gas Field". New Matilda. 6 November 2018. Retrieved 30 November 2018. Osborne, Robin (1985). Indonesia's secret war : the guerilla struggle in Irian Jaya. Sydney: Allen & Unwin. ISBN 978-0-86861519-6.